Samuel and Sara were born in Curitiba, in the Clinics Hospital in the turning of the day 12/31/2017 to 01/01/2018. The child-birth was normal and were born in the 38th month of gestation. The boy was born at 23:44 hours and the girl was born at 00:06 hours. The mother Michelle figured out that was pregnant on the 8th week and was very happy to know that were twins. She already have a 4 year old son. 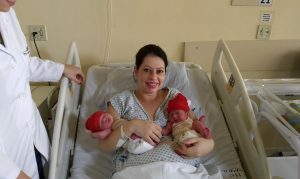 The babies were born healthy and are very well, happiness to the family. Next articleHow do the giraffes sleep?